Samsung is planning to unveil a smartphone with a curved glass display next month according to D.J, Lee, Samsung’s mobile business head of strategic marketing. The announcement came during a media event to launch the Galaxy Note 3 in Seoul, South Korea, on Wednesday, the BBC reported. Ben Wood, analyst at research company CCS Insight, said a curved screen wouldn’t radically change the smartphone user experience but it does help Samsung differentiate itself in a crowded market where phones are homogenous, flat-screen rectangles. Curved displays are something Samsung has been working with internally for quite some time. The company showcased a curved smartphone prototype at this year’s Consumer Electronics Show back in January. The 5-inch, 720p quality panel on that phone was constructed of a thin piece of plastic that was said to be virtually unbreakable even when dropped. The unnamed prototype featured a display that extended over the edge of the phone which could allow a user to quickly read a line of text or check a stock ticker without having to have the phone out for a full front-on view. Elsewhere, Samsung has also been experimenting a lot with flexible displays. Technical hurdles aside, the main problem with flexible displays thus far has been figuring out a practical use for them. Samsung even went as far as to launch a contest over the summer offering cash prizes totaling $20,000 for flexible display device ideas. 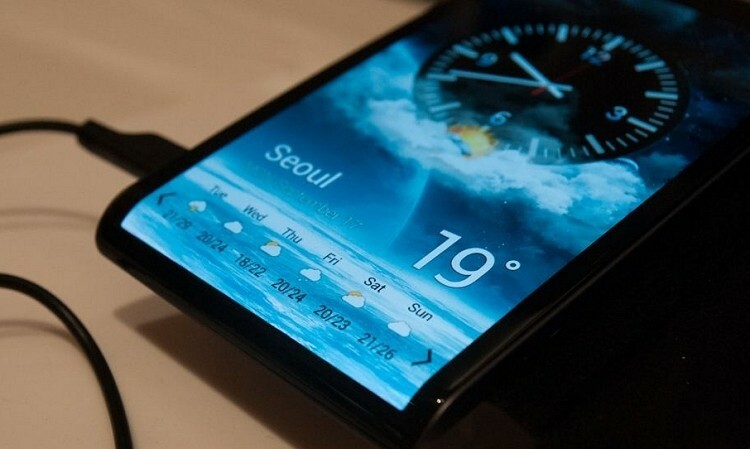 Many thought we might see flexible displays used in Samsung’s smartwatch but now that the Galaxy Gear has been unveiled, we know that isn’t the case.